BJM SKX Series 316 Cast Stainless Steel Pumps with Shredder Action Impellers #tencarva most commonly used for a variety of municipal, industrial and agricultural applications including: sewage sumps, industrial sumps, sump pits, agricultural, animal waste and for corrosive environments that have solid wastes that may need to be shredded or cut. The pump was designed for pumping liquids that typically corrode cast iron pumps. They do not have suction or NPSH limitations of self-priming pumps. 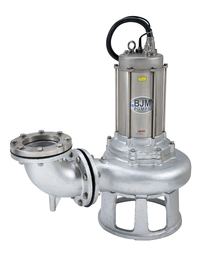 The SKX -pumps have non-clog impellers designed for high volume and lift performance. It can take a 2-liter bottle and draw it in and shred it to pieces in a matter of seconds! BJM Shredder Pump 2D Video from Suzette Pascal on Vimeo.